 Turnabout is fair play. The woman mythologized as an enigmatic Indian maiden by Romanian scholar Mircea Eliade in Bengal Nights (see below) offers her own novelized version of their supposed torrid affair. Imagine making a trip to Europe as an adult and finding people who know intimate details of your teenaged years. Such was the experience of Devi (who died in 1990, an accomplished poet and scholar) when she found that Eliade, a renowned scholar of religion, had written a ``semi-autobiographical'' (he uses her actual first name in his story) account of his time with her family in Calcutta in the 1930s. When she heard that the young man with whom she had first felt the pangs of passion--but, in her account, had next to no physical contact--had portrayed their relationship as a wild, sexual affair that ended when her staunchly traditional family learned of it, her pleasant memories of the events turned to anger: This man ``whose memory I preserved in the depth of heart as a sacred trust...has been selling my flesh for a price.'' Now, after Eliade's account has appeared in several languages and on film, Devi uses fiction to tell her side of the story. In lucid prose that calls into question the concepts of time, memory, and the adventuring spirit of the colonizing West, she undercuts Eliade's portrait of a curious, naãve girl by showing just how cosmopolitan and precocious she was. 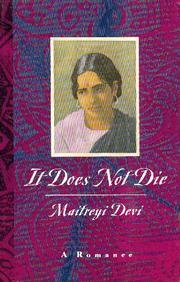 After all, her first book of poems was published, with a preface by Rabindranath Tagore, when she was 16. She also denies that their affair led to beatings and disgrace. An engaging story from a talented and skillful poet, philosopher, and storyteller having her say about the tangled threads of passion and memory.